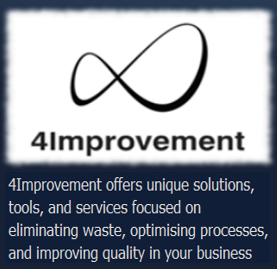 4Improvement™ is founded and Owned by John Knudsen. As a consultant, John sees it as his main task to point out and resolve challenges, which ultimately secures an even better profit for the business. John's overall approach to both organisations and tasks is: "You don't know what you don't know". Or, put a bit more directly: "Anyone who doesn't have facts to act upon, is groping in the dark". John has been working with management strategy, Supply Chain Management, Quality Management, continuous Improvement, and Lean concepts for more than 20 years. He is thus both broadly and firmly seasoned within management strategy and optimisation throughout the organisation. Furthermore, John has 7 years of succesful track record of integrating World Class Manufacturing (WCM) and Total Productive Maintenance (TPM) in production companies. John has an analytical and practical/hands-on manner and works from facts-based material and analyses. This ensures that decisions and optimisations are not based on gut feelings, but may be directly embedded in the organisation. Moreover, John offers his own company-specific and easy-to-use software systems and solutions, which support the implementation of change and strategy processes that allow the realisation of the true potential of the organisation. John has experience as a consultant for Danish as well as international companies.